a. Make the whole solar system! Use the information from the Kids Astronomy website to help the child learn about and make proportionally sized paper mache planets. b. Colour Mixing. While making the different planets, explore how to make new colours by doing some colour mixing. 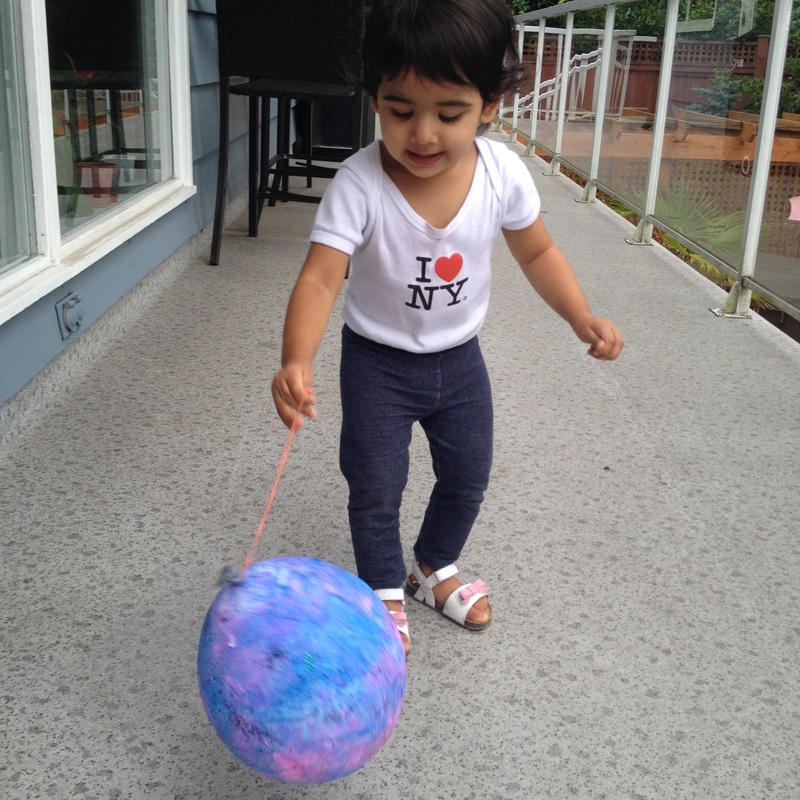 Offer the child the primary paint colours (red, yellow and blue) and have him/her create new colours in order to paint all the planets. R has so much fun with this activity! She experienced a mixture of fear, with the sound of the air coming out of the balloon, and sheer delight, as the balloon flew across the string. Thread yarn through a straw. Secure both ends of the yarn to two anchors. We used two chairs to secure the yarn. Using a piece of double sided masking tape (or a piece of masking tape rolled to have all sides sticky), attach a balloon to the straw. With the balloon rocket at one end of the yarn, blow up the balloon. 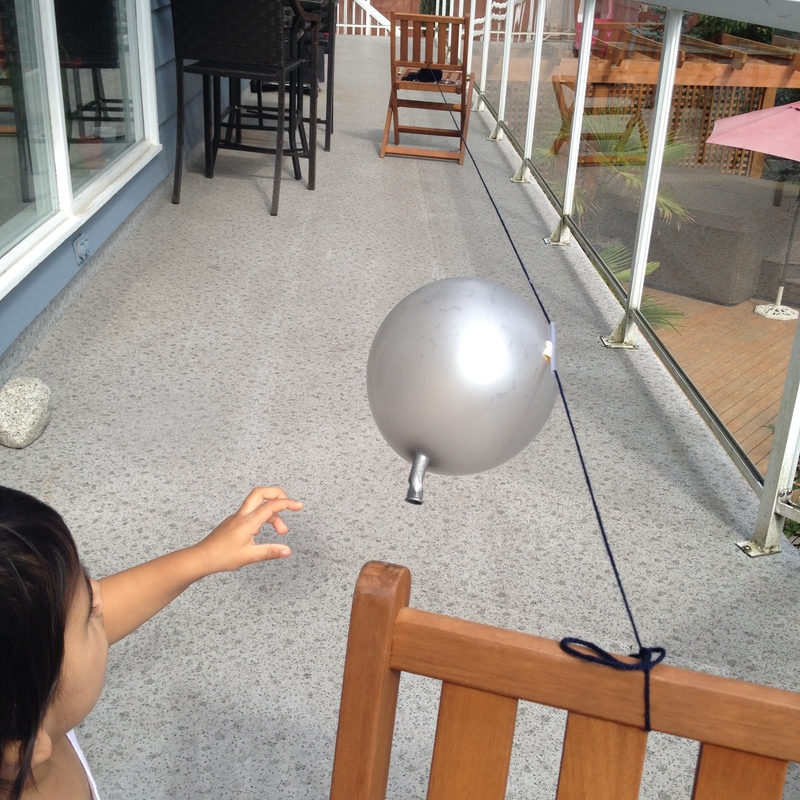 Hold the end of the balloon with your fingers until you are ready to make the balloon fly. a. Explore Friction. Have the child experiment with different textures of yarn or string to see what material allows the balloon rocket to travel the farthest. Have the child record him/her observations in a science journal. b. Explore Gravity. Attach the yarn at different angles between the two anchors and ask the child the following questions: Does the angle of the yarn affect the distance the balloon rocket travels? Can the balloon rocket travel up an incline? I made some matching planet cards by gluing coloured circles onto black card stock that was sprayed with Perfect Pearls Mist. It was R’s job to find the match. I handed her one card at a time and told her to find its match. She didn’t understand the concept, so instead, I hid the cards around the room and R searched for them. a. Play Concentration. Flip the cards over so that the planets are all hidden. Have the child find a match by flipping two cards over at a time. If s/he gets a match, s/her gets to keep the two cards. If s/he doesn’t find a match, then the cards are flipped back over and the next player gets a turn. 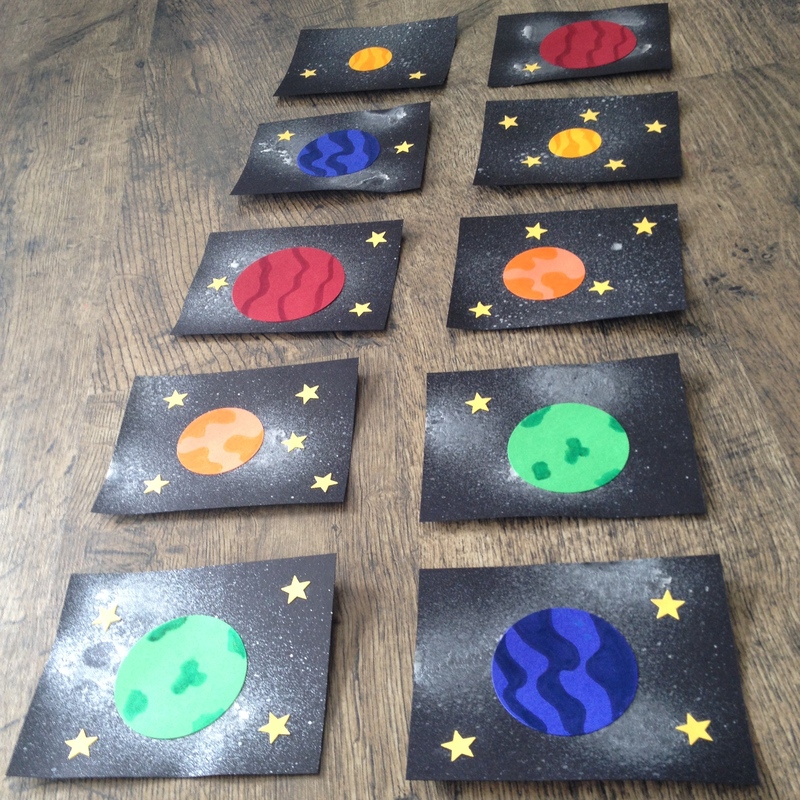 Lara wanted to have a nice and simple space themed invitation to play for her son and decided on doing this awesome activity! 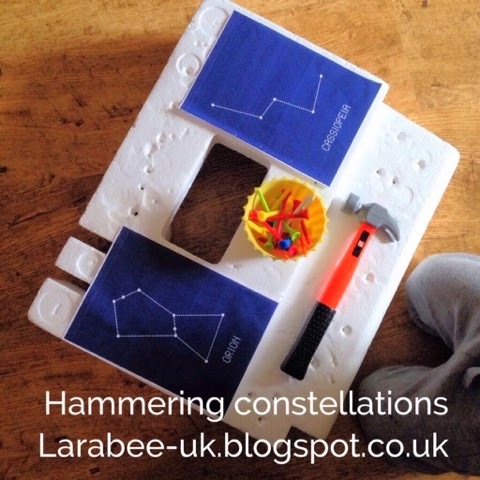 You can see Lara’s original post here and her entire space themed round up here. Allow an older child to insert the golf tees him/herself or pre-insert them for younger kids. Hand him/her a toy hammer and let the fun begin! I love you crafting ideas and how you are so creative in teaching your children! Thanks! Thank you! I was lots of fun for the both of us!